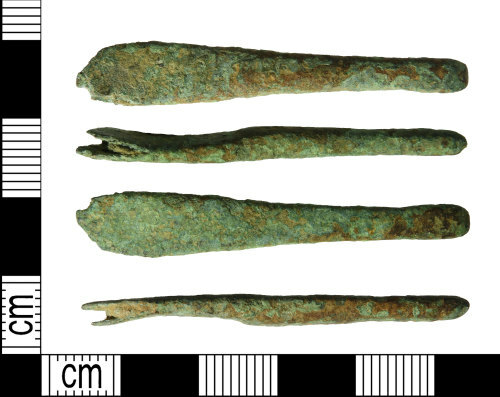 Early medieval copper alloy strap end, 50mm long, 8mm wide and 3mm thick with a weight of 5.26g. The object is rectangular in form and cross section. Its upper half has a spilt end to house the strap and this is damaged. Below that the object has slightly rounded sides and it then tapers in width and becomes thicker, terminating in a possible animal head terminal? this is now extremely worn. The object is probably a Thomas class B1 or B2.